The promotion of safety, education and training programs for steel erector trades. Development and promotion of standards. Cooperation with others in activities which impact the commercial construction business. 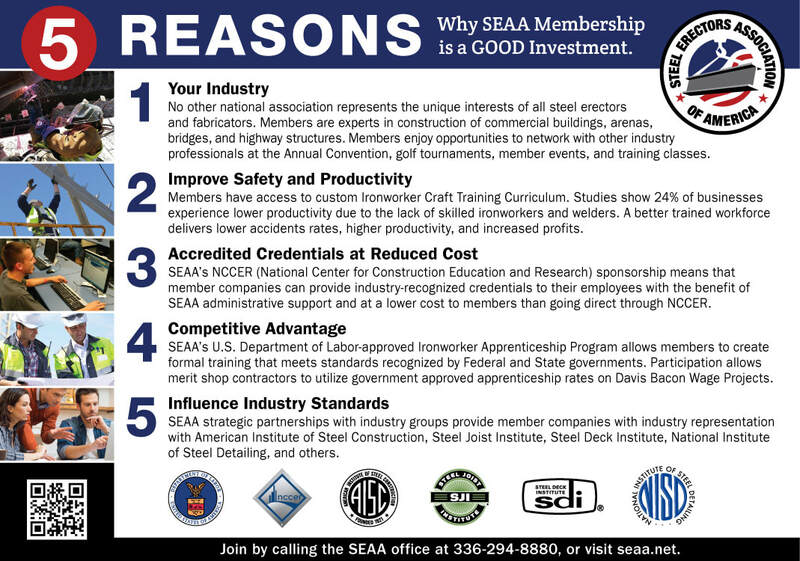 SEAA develops strategic partnerships and works closely with industry groups to provide members with industry representation steel design, engineering, fabrication, labor, safety, and training groups. Free listing in the Business Directory. Members can manage their listing themselves by logging into the Members Only section. Discounts on registration to the Annual Convention. Free subscription to Connector Magazine. Receive e-connector newsletter and safety alerts. Special pricing for SEAA products. In 1972 a small, local group of North and South Carolina steel erectors formed a non-profit organization that was then known as the Steel Erector's Association of the Carolinas (SEAC). Later, with the addition of members from Virginia, the association changed its name to the Steel Erector's Association of Virginia and the Carolinas (SEAVAC). The organization quickly grew to represent steel erectors and associated companies throughout the United States and in 1992 became known as the Steel Erectors Association of America (SEAA).